Doctors Rethink How To Treat Opioid-Dependent Newborns : Shots - Health News A pediatrician is working to make sure every hospital in Kansas can give babies with neonatal abstinence syndrome the soft start they need, ideally right next to their mothers. Victoria gave birth to her daughter Lili while in treatment for opioid dependency. Jackson is now heading a statewide effort to get hospitals in Kansas to change their approach to treating neonatal abstinence syndrome, as the condition is formally known. Babies with this condition will scream inconsolably, clench their muscles and often have trouble sleeping. The treatment Jackson recommends is to keep mothers and their infants together in the hospital, making sure babies are held and comforted--and to provide opioids (in gradually decreasing quantities) to ease withdrawal symptoms until the baby can be weaned off of them. Research shows that this approach is more effective than keeping the baby in the NICU, which is a common practice. It's estimated that around 2 percent of infants are now born drug dependent, and in areas gripped by the opioid crisis, those numbers are even higher. The low-tech, high-touch treatment approach that Lili received in the first weeks of her life is one that health experts are encouraging hospitals everywhere to adopt as they grapple with the increasing numbers of infants born with drug dependencies. Jackson says that, in parts of Kansas, she's starting from scratch. "Many hospitals have no standard of practice. No standard approach," she says. But improving outcomes for opioid-dependent babies will clearly require more than just educating hospital staff. Dr. Elisha Wachman is a neonatalogist at Boston Medical Center and a professor at Boston University. She says providing this kind of care can be a big adjustment for hospitals. "It really depends on the capacity of the hospital and where they house the babies for monitoring," Wachman says. "Some of them don't have room for the mothers to stay with the babies." Compounding the problem, the matter of exactly what are the "best practices" is far from settled. For example, new research suggests that for newborns methadone may be a better recovery drug than morphine, which Wachman says is most often used, even though doctors are still unsure about morphine's long-term effects. "There's very few high-quality clinical trials that have been done in this population of infants," Wachman says. "If you can imagine, this is an incredibly difficult population to study. To do a randomized, controlled trial, for instance, of opiates and neonates is incredibly challenging." Jackson acknowledges the challenges, but she says establishing consistent practices based on what doctors do know is an important first step toward getting answers. When Lili was born, Victoria says she did everything she could to help her daughter get healthy in the hospital, with no idea whether the newborn would be taken from her and placed in protective custody. "I was trying not to be connected with her, because, I thought, they're probably going to take her," Victoria says. "I haven't been clean that long. So I was trying to not, like, be in love with her. But I was so in love with her." Lili is her fourth child. Victoria continues to show state officials that she is committed to staying off drugs. She has been allowed to raise Lili at Amethyst Place, a recovery home in Kansas City. Lili is now a 16-month old girl who shares her mother's blonde hair, bright eyes and big smile. 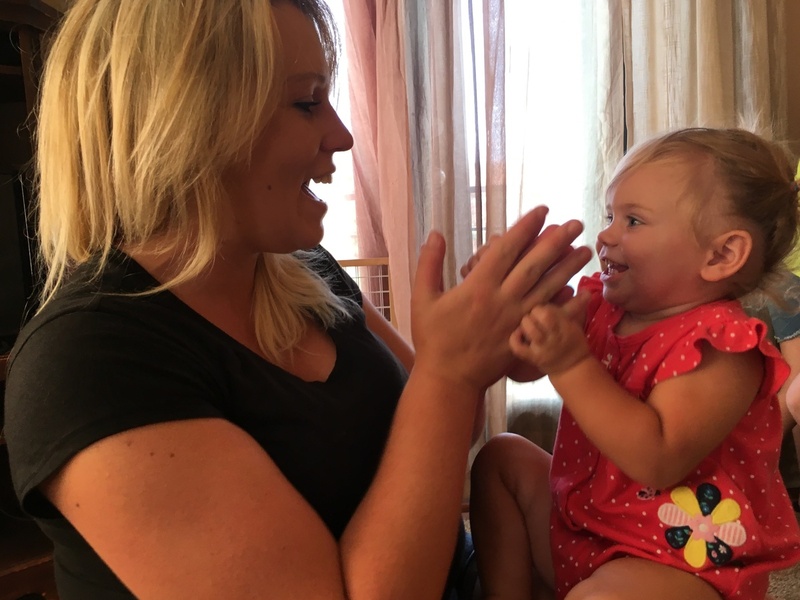 Despite her difficult start in life, the toddler is in good health, and her mom has been drug-free for a more than a year and a half. This story is part of NPR's reporting partnership with KCUR and Kaiser Health News. Alex Smith is a health reporter at KCUR in Kansas, City, Mo.